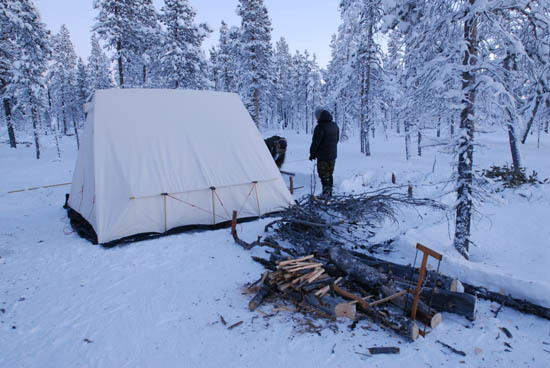 A Winter Camping Trip in the Northern Forest. Winter camping in the northern forest can be an amazing experience. Also known as the boreal forest or the Taiga, the environment is simply beautiful. 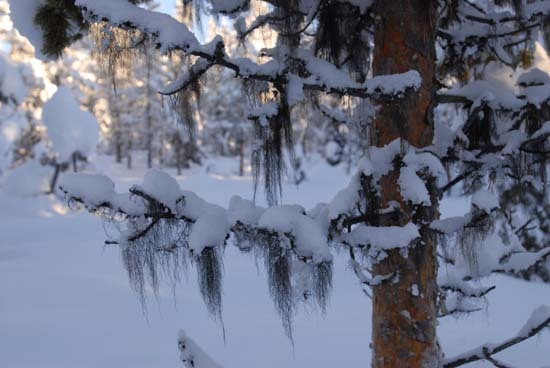 In many ways travel in the northern forest is easier in the winter than in the summer. The swamps and lakes are frozen and passable, as are the rivers which become your highways. There are no mosquitoes or other biting insects. The winter, however, brings its own specific complications and hazards and you must have the requisite wilderness bushcraft skills and winter camping equipment to ensure your comfort and safety. 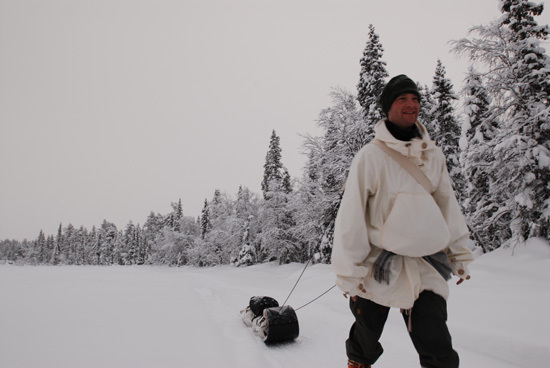 One way of travelling in the northern forest in winter is with snowshoes and a toboggan. It is this type of trip that I undertook recently, in Northern Sweden, 125km north of the Arctic Circle. It was only a short trip but our experiences on this trip illustrated some important facets of winter travel and camping in the boreal forest. All the photographs in this article are from this recent trip and were taken by the author, Paul Kirtley. The northern forest also goes by the names ‘boreal forest’, ‘taiga’ and ‘northern coniferous forest’. Boreal comes from the Greek boreas and relates to the north. Taiga is a Russian word, commonly used to describe the vast forests of Siberia. Conifers are the dominant tree type in the northern forest, hence ‘northern coniferous forest’. We chose to make a journey by snowshoe and toboggan, because this traditional combination is well-suited to the undulating forest landscape we would encounter. For a self-propelled winter camping expedition, hauling a toboggan allows you to transport more equipment and supplies than, say, ski-touring with a back-pack. Snowshoes allow you to walk in the deep snow and access the forest for firewood and other materials. Even if you travel by snow-machine, it is wise to take snow-shoes (or skis) in case there is a problem with the machine and for working around camp. Getting around in deep snow without something strapped to your feet is very hard work! We spent a couple of nights in a cabin while we tested and adjusted some new equipment then headed out with our toboggans loaded with all of our personal clothing and equipment, as well as food, shared camp equipment, tent and stove. The great toboggans we used were from Black River Sleds. We travelled along a river, across swamps and lakes, through virgin powder and on established winter trails. This is typical of northern forest travel and before setting out you should have the wilderness skills and knowledge of the environment to make this type of travel possible. Navigating in winter is harder than in summer. Natural features become less distinct as the relief is smoothed over by soft snow. Under this blanket, the exact boundaries between land and frozen water become difficult to determine. Shapes are blurred. Vegetation is covered. Swamps and lakes are easily differentiated in summer; in winter they look the same. Everything is white. Travelling in the Northern Forest. 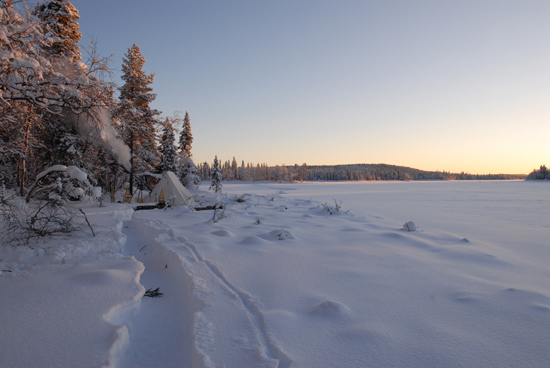 A tent heated with a wood burning stove is the ideal way to camp in the boreal forest in winter. Even a modern mountain tent is extremely cold in winter. I have spent plenty of nights sleeping out in snow-trenches, quinzees and other improvised shelters. Generally there are two things that are hard to achieve with these: Quality relaxation/rest and the drying of clothing. Winter daylight is in short supply. Your day, while generally quite physical, finishes early. The night is long and you spend many hours in your shelter. The more comfortable it is, the better you will rest. A build-up of frozen moisture in your clothing and sleeping equipment will reduce their performance significantly. If you cannot remove this moisture, it will become a major limiting factor in your ability to continue functioning in an arctic environment. Winter Camping in the Boreal Forest. In a canvas tent with a wood-burning stove, you can take off your heavy clothes and footwear, dry them in the warm, dry atmosphere, cook and warm yourself through. A further advantage of a warm environment in which to rest and sleep, along with warm, dry clothes to put on in the morning, is that your body burns fewer calories staying warm. We used a tent and a stove from Snowtrekker Tents and we found it very suitable to our needs. With four people, equipment and a hot stove in a 12×9 ft tent, you need to be organised. But we were able to cook, relax and dry all of our clothing. Sleep was comfortable with us a different member of the group taking on the role of ‘fire-guard’ each night, making sure the stove remained fuelled and safe. Inside the tent, you can relax, cook and dry your clothes. Note the clothes hanging up high in the tent. Even if you intend to camp in a heated tent, however, emergency and improvised shelters are life-savers in the boreal forest environment. Knowledge of, and experience in, this area of northern wilderness bushcraft should not be neglected if you wish to enter the northern forests fully prepared. Everyone on our trip also had some experience of sleeping out in improvised shelters in the northern forest in winter. Even if we had lost the tent, we would have coped. As our trip was only short and we had plenty of carrying capacity, we took all of our food with us. We made sure we had plenty of calories, with all the major food groups represented but with more fat and protein than we would eat in warmer climes. We took porridge, crackers, rye bread, salami, cheese, biscuits, jerky, chocolate, boiled sweets, butter, jam, and a range of dehydrated evening meals (including a custard and fruit pudding about which some of us remain ambivalent), tea, coffee and sugar. Most of it was good, apart from a hot muesli breakfast which smelt of cheese/baby’s vomit. We found the most essential ingredient we took was Tabasco sauce. It improves almost any meal. But not, alas, the hot muesli breakfast. I have used dehydrated meals extensively on ski-touring, back-packing and canoeing trips and there are some very good ones on the market these days. Dehydrated meals are very light in weight for the calories they provide and very welcome when you are tired and short of time. They also require you to carry less cooking equipment. Even the best of them, however, are lacking compared to real cooking from base ingredients. Given the carrying capacity of a toboggan, on a longer winter camping expedition, we would take some ingredients for cooking from first principles for taste and variety as well as some dehydrated meals for speed/convenience when we needed it. On a longer trip, with more time to remain in each place, we would also look to supplement our supplies with fish and ptarmigan. Whether in a stove or outside, the ability to light fire is an essential skill in the north for drying clothes, warming your body, melting snow for drinking water and cooking. 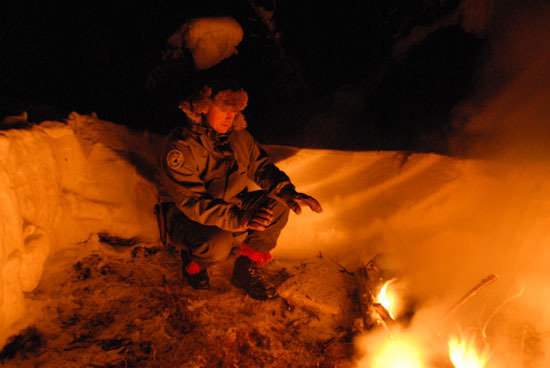 In a survival situation, a fire can also be used to signal. The acquisition of water should not be underestimated. The freeze-dried air increases your body’s need for water. At the same time, in a frozen environment, water is difficult to come by unless you can melt snow. You are effectively in a desert. Accessing water under the ice can be impossible without a specialist tool such as an ice chisel or an ice auger. With a fire you can generate as much drinking water as you need. The author warms himself by the fire. A fire can be a life-saver in the boreal forest. There were several easily available tenders where we travelled, namely birch bark and Alectoria lichen or ‘Old-Man’s Beard’. From resin-infused pine, you can also produce feathersticks of sufficient quality that they will readily take a spark. For kindling, dead twigs from the lower parts of spruce and small pine trees are easily available. 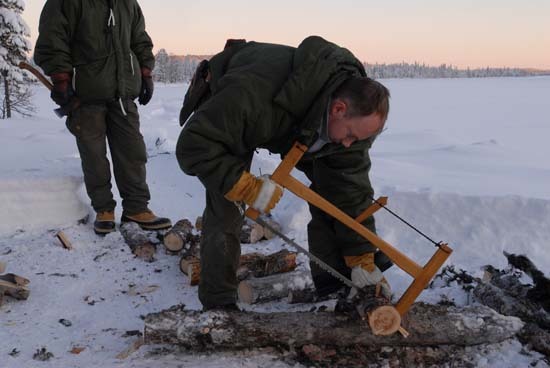 You can also split larger timber to produce fuel of all sizes, including small splints for kindling. Alectoria Lichen or 'Old Man's Beard' festoons many of the trees in the boreal forest. Collected and dried a little in a pocket, it is a good tinder for fire-lighting with sparks from a Swedish Firesteel or 'Fireflash'. In the part of the boreal forest where we were travelling, there are three species of trees – Spruce, Pine and Birch. When looking for firewood, dead, standing timber is the driest wood. Upright timber will be relatively free of moisture and should not have too much snow or ice on it. Dead Birch is generally not as good as Pine or Spruce since in this frozen environment birch tends to act like a sponge, holding onto moisture. We made extensive use of dead-standing Spruce and Pine, and had no problems in establishing and maintaining a good fire. Since Pine and Spruce are both evergreen, it is easy to identify the dead trees as they hold no needles, giving them a somewhat skeletal appearance. The trunks of the Pine and Spruce trees containing well-seasoned dead timber tend to appear a uniform grey colour, making them easy to spot from a distance. Whether you are fuelling a wood-burning stove or making a long-log fire, the ability to process dead, standing timber into firewood is very important. A good axe is an essential tool, more important than a knife in this environment. If you have your clothes, an axe and a means of making fire, then you can survive. An axe, however, is a dangerous tool. More so in an environment where you will be wearing gloves, standing on soft snow and quite possibly wearing snowshoes or skis underneath your feet. 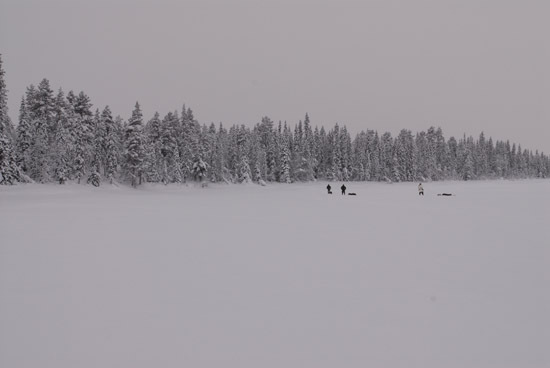 The boreal forest in winter is not an environment for a novice to get to grips with an axe. 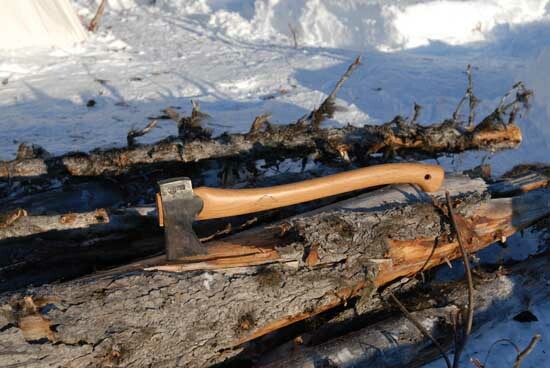 It is much better to learn to use your axe confidently and safely in the easier, warmer summer months then carefully transfer your skills to a winter environment, bearing in mind the additional awkwardness and associated risk factors. An Axe: the most important tool of the northern forest. In addition to an axe, a buck-saw or bow-saw makes the job of processing firewood both more safe and more efficient. The combination of axe and saw makes a very powerful combination. Since only two of us would be using an axe, we carried two Gransfors Bruks Small Forest Axes and two folding bucksaws between the four of us. Each member of the group carried a fixed-blade knife and a folding ‘Laplander’ saw on their person. A full-sized saw makes sectioning firewood an efficient and safe job. 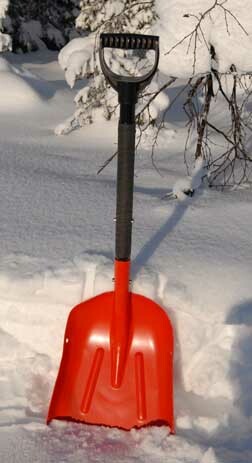 Snow Shovel - a much under-rated tool of the north. A much under-rated tool of the north is a snow-shovel. There are many occasions when the ability to move snow quickly and efficiently is desirable. A good quality snow shovel makes all the difference. Moving powdery or granular snow requires more of a sweeping motion than a digging action. An extendable handle helps achieve this motion while avoiding back strain. A D-shaped handle allows you to grip it even when wearing mittens. When working in confined spaces such as hollowing-out a quinzee, the handle can be reduced to its minimum length. A metal blade that is shaped to cut into hard snow will make relatively easy work or carving away compacted snow when hollowing-out a shelter. Finally, customise your shovel by adding hockey-tape to the metal shaft to reduce the conductive heat loss from your hands when using the shovel. A small stiff-bristled brush is useful for removing snow from clothing and equipment. The removal of snow is important because otherwise as you enter the warm environment of a heated tent or cabin, the snow begins to melt and moisture is introduced to your clothing, boots, etc., as well as the warm, dry space itself. 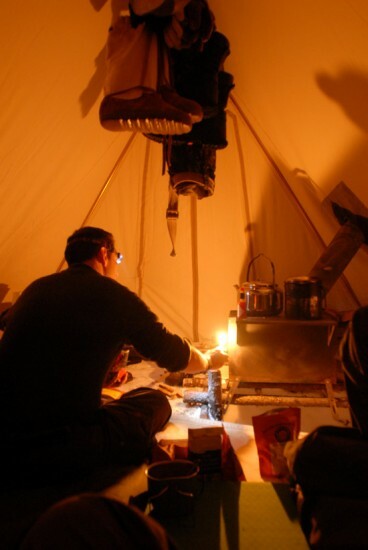 Much better to brush all the snow off your boots, including the soles, before you hang them up to dry than to have them dripping on you and your kit in the tent. I use a 99 pence wooden-handled potato-scrubbing brush. It is only a little bigger than a nail brush and I keep it in a pocket of my smock. Boreal forest temperatures can drop down to -50oC (-58oF), sometimes even lower. On our trip the temperature dipped to -38oC (-36oF). This is not unusual and you must go prepared for low temperatures. The obvious dangers associated with low temperatures are cold injuries and hypothermia. You must have clothing, equipment and experience enough to deal with the conditions. Even then, you must be careful. 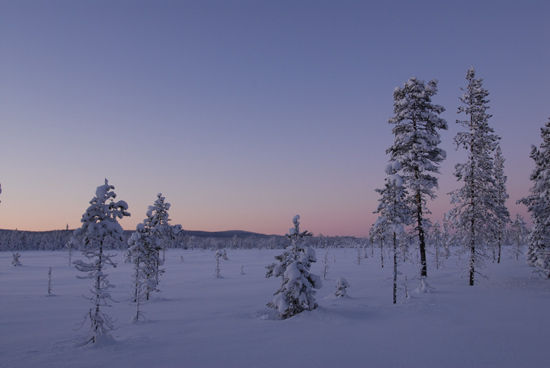 The boreal forest in northern Sweden regularly experiences significant swings in temperature, some of which can be rapid. This is due to the geographical positioning of Scandinavia along with the proximity of the sea. On my recent trip we experienced a cold day of minus -20oC (-4oF) to -30oC (-22oF), with an evening drop to a low of nearly minus 40. This was followed by an overnight upswing to about -8oC (18oF), for the following day – nearly 30 degrees centigrade difference in less than 12 hours! That day, the temperature rose a little further to the extent that the snow falling on us was wet. This was followed by a clear sky that evening with an allied drop in temperature to between-10oC (-14oF) and -20oC (-4oF). Rapidly changing temperatures in the boreal forest can cause the winter camper more difficulty than constant cold. The change can take you by surprise, particularly when temperatures drop rapidly. When the temperature drops suddenly, if your clothes are damp, then you can have a problem. Second, managing your layering, hand-wear, head-wear and temperature can be difficult. It can be hard to judge how many layers to put on for the day. If temperatures rise, you can end up too hot and sweaty. If temperatures drop, while you are working hard, the cold can creep up on you and hit you hard when you stop. Varying temperatures also change snow conditions from one day to the next. If the temperature is above -10oC (-14oF), it becomes difficult to create a solid platform of snow on which to pitch a tent, and quinzees will not freeze well. In some ways the stuff of nightmares, open water is an area on a body of water that has not frozen over and is, as the description aptly puts it, open. 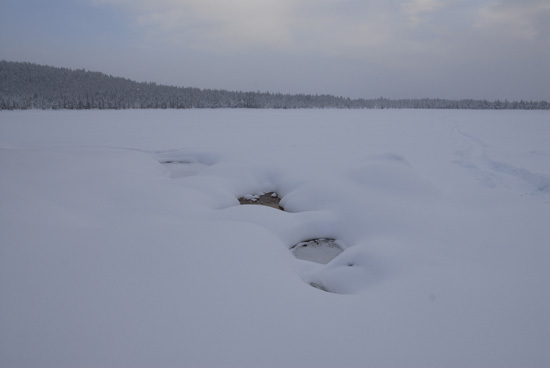 Open water can occur where the temperature or the movement of the water prevents it from freezing, despite sub-zero Celsius air temperatures. We saw open water on the river and this was in areas such as rapids and narrower sections, where the flow of the river would be faster. On the river we also avoided numerous depressions in otherwise uniform snow. 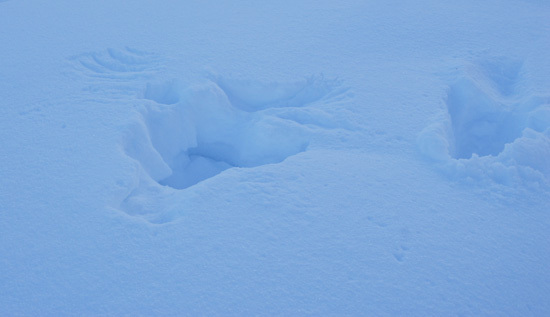 These dips in the snow indicated the possibility of areas of previously open water that had recently frozen over and started to be covered with snow. Here the ice could still be thin. On foot, you have more chance of seeing open water before you reach it than you do while travelling fast on a snow machine. Open water on a frozen river poses a hazard. Several times on our trip we came into areas of overflow water. Overflow is often created by the weight of snow on top of the ice causing water to be forced out through cracks in the ice (often where it meets land) or areas of open water. Overflow water then seeps under the snow that rests upon the ice, seeking the low-points of the surface of the ice. Overflow sits as a layer of water between the ice and the snow above it. The snow insulates the water from the sub-zero air, preventing it from freezing. Overflow often exists on top of thick, solid ice and is not necessarily an indicator of thin ice. The primary problem with overflow is getting wet in cold air temperatures. When you walk into overflow you can get wet feet, snowshoes and equipment. 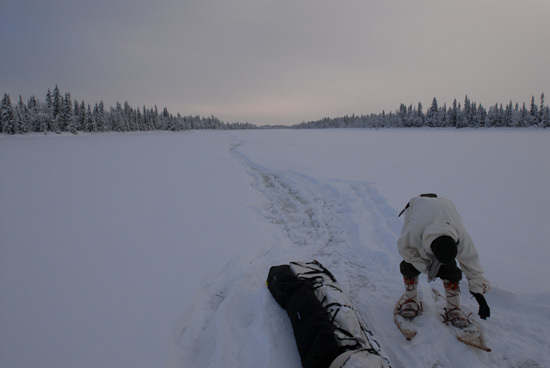 As soon as the water is exposed to the air temperature it freezes rapidly, creating a heavy layer of ice and snow to stick to snowshoes, boots and sleds. Removing ice from equipment after encountering overflow. The overflow can be seen creating dark patches in the trail behind. Note the sled is on its side while the slush stuck on the bottom is allowed to freeze solid. It can then be chipped off easily. By their very nature, stoves get hot. The slightest touch of a hot stove can burn skin or melt synthetic clothing. Even parts of a stove that are designed to dissipate heat so they remain cool enough for you to touch them (like a handle on a stove door or a damper control) can get too hot and burn you. Some caution and a pair of leather gloves will help avoid burns. You also need to take care moving around near to the stove as a trip or fall onto the hot metal could cause serious injury. Remember the snow around a warm stove can soften, making it more likely to give way when you stand or kneel on it. It is possible to get a stove so hot that parts of it glow red, particularly sections of the chimney. You need to be very careful as an overly hot stove could contribute to a tent fire. A hot kettle on the stove and mugs of hot drink in a confined space with no firm surfaces are also hazards of which to be aware. You don’t need much hot water on a hand to create a debilitating scald. Why Visit the Northern Forest in Winter? You may be thinking that visiting the boreal forest in winter is a hassle and hazardous. Certainly a winter camping trip here should not be embarked upon lightly. But I think the rewards of making the effort are worth it. Beautiful light on the northern forest. For me the winter landscape of the northern forest is something to behold. The light can be incredible. The low arctic sun at dawn and dusk can produce soft, subtle hues of light that, when projected onto the snow-covered land, are just stunning. 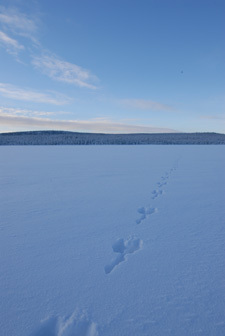 Hare tracks in the snow across a frozen lake. When the air is clear and the sun is out, the environment appears pristine. The snow is bright white, clean, undisturbed. Ice crystals twinkle. The forest is silent. If you stop and listen, it’s like a tomb. It can seem as if every creature has gone. Most of the bird life has indeed migrated south, with only a few species staying all winter. There are birds and animals in the boreal forest in winter – we saw capercaillie, elk, reindeer, and their tracks, ravens as well as the tracks of fox, hare and ptarmigan. Lynx, wolf and wolverine also populate this area of Sweden although we saw no evidence of them. This was no surprise – I’ve only once before seen wolverine tracks here. Here you can see the hollows that the Capercaillies have created as shelter. You can also see where one has left impressions of its wing-tips in the snow whilst taking flight. When you enter the forest itself you gain a small taste of the vastness of the Taiga. Even a little way from a winter trail, surrounded by trees, you realise there is the real possibility of getting lost in the northern forest environment. When you gain a vista over an area, all you see are trees and patches of white, under which lie lakes, swamps and rivers. It is real, unbroken, wilderness. It is an environment where wilderness bushcraft skills make perfect sense. Indeed, you need bushcraft every day you travel in the boreal forest. It is this combination of a stunningly beautiful, yet harsh environment, combined with necessary reliance on wilderness skills that makes the northern forest in winter so alluring. Take Care When You Enter the Blue Zone. Stunning scenerey. Thanks for sharing your trip with us Paul, been missing your blog the last coupla weeks. Really nice article, and wonderful pictures. I like the snow shoes you are using, where did you get those? Or have you made those by yourself? You can buy them ready-made or in kit form. Hi JD, good to be back and see that people are still here! A truely beautiful place.Thanks for sharing Paul. id love to know Paul how you decided on the area to visit and what kind of prep was necessary? Well I know the area quite well and the other guys have been there before too so it was an easy choice. The prep involved gathering all the necessary equipment and supplies together, then shipping it out to Sweden. If you haven’t been to a really cold environment before, I would recommend you to build up your experience gradually, making sure you have a safety net. Thanks for the great article and photo’s it must have taken some time to put together. I would love to camp out in such a place, the experience as you describe it seems almost spiritual. I also appreciate the detail you give and the links to products you recommend, I always value personal recommendations from someone who knows what they are doing over the blurb put out by company marketing men. Looking forward to more posts to come and getting outside more myself this year. Thanks for the feedback. I’m glad you enjoyed the article and the links. It was a great place to camp. Let me know about your own adventures this year. Great pics! to add the sudden temp changes are truly evil, and compounded if you are involved in arduous work at the time, while on Exercise in southern Norway near Fagerness, building quinzhee shelters, removing layers while working as we built up body warmth, then having to put them back on as we felt a decent drop in temp, only to have to remove them again only ten mins later as through the activity we had warmed again, it almost becomes as much of an activity judging what you need to be wearing as what ever your trying to achieve. but absolutely important to get right, as there was no real heating in the snow shelter other than body heat and a candle! fantastic. Thanks for sharing your experiences. I think this is a really important thing for people to get straight in their heads – looking after yourself in those conditions is an effort. For those not accustomed to it, donning and doffing layers all day long can seem an unneccessary hassle. But as you say it is essential. Even more so if you don’t have a heated tent or cabin…. On this type of trip we get our water by melting snow. We melt it in a pot on top of the wood-burning stove in the tent. As long as we keep the stove going and the ambient temperature inside the tent warm enough, then the water doesn’t re-freeze. If you shut the stove off overnight, however, the water will re-freeze in the pot. To keep some water from freezing while out during the day, we each take at least one 1-litre insulated flask. You can use this to make a warm drink or add snow to make a cold drink of water (and add more fluid than you are carrying). If we are moving camps, we make sure we have a good drink in the morning, take our flask with us during the day then top up again in the evening once the tent is set up and stove is going. Yes, there are sometimes areas of open water but they are very dangerous to go near so that is not an option. Even if you are not in a tent, as long as you can make a fire you can obtain water in this environment. Whereabouts are you from Daniel? Which glacier do you camp on? I figured you didnt risk the open water and Im glad you brought the dangers up in your artical, I live in Juneau, Alaska and went camping on the mendenhal glacier, it is only a few miles from our house. While up there we had to melt snow with backpacking stoves, and we kept the water in our sleeping bags with us to keep them from freezing. The water was so pure we also had to add electrolytes to replace what we lost. When staying in what I guess you would call a bush shelter, I just keep the fire going and my water near it. I was told and have found that adding a little water first helps in melting snow. Have you heard that or is that just some crazy alaskan thing? In the forest, while the snow is pretty pure, we don’t add anything to it as a matter of procedure but we do take a some isotonic drink powders to make up hot juice drinks in our flasks. We also eat pretty well generally and avoid sweating to much (to avoid too much moisture in our clothes). As for water in the pot helping to melt snow – yes it definitely helps speed things along. And once you have some warm water in a pot, you can add quite a lot of snow to it and melt it quickly. That’s why it’s worth taking a larger cooking pot (or a kettle) than you would normally need. Then you can take water out of it without exhausting the supply and then add more snow to it. I always enjoy your articles and this was no exception. I know this article has been out a while but I wonder if you could check over your temperature conversions, as I found one that was incorrect “If the temperature is above -10 C (-14 F)…”, as it should be +14 F, not -14 F. I realize the US is one of few countries that still use it, but I’m surprised I was the only US reader that noticed this. Thanks for sharing your story. You always have to vigilant when it comes to overflow. You are right – on a snowmachine, you have to just keep going and skim over the top. Well played. Hi Paul I read this fantastic article on your Northern Coniferous Forest trip. I would really love to still be able to visit such a truly beautiful peaceful place, however my chronic arthritis would not make it practical.I enjoy your site as a real source of information. Being an insulin dependent diabetic I was glad to see the hypoglycaemic link to hypothermia in your advice. The “mumbles” made me chuckle to myself. Thanks for your comments on this article. I’m glad you enjoyed it but sorry to hear you are not as able to get out for adventures as you once were. I hope my articles help transport you to some of these spots though. I’m glad you find the blog useful for general information too. Being an Omega wearer myself, with a metal strap, what do you do with the watch on an arctic trip? This article inspired me to winter travel. And of course, thanks for the tips and tricks. Sounds like a nice trip. Hopefully i’ll go up further north some day myself, i have a -39C sleeping bag arriving this week. Even at lower latitudes like the inland sea of Mälaren, temperatures can reach down -30C. Around that temperature or lower, i remember that it starts to hurt your face when you go outside. A tip: whenever you go onto frozen lakes you should be wearing ice picks ( https://sv.wikipedia.org/wiki/Isdubbar ), even if you know the technique to get out of icywater, they are essential on the ice. A good tip i learned is to stay away from parts of water that looks like it could be flowing in summertime (i.e. narrow areas, channel openings) and even around bridges which could have weak ice. Thank you Paul for this wonderful article with impressive tips and insight into winter camping, along with the excellent photographs. I am a “newbie” to bushcraft, but have had a keen sense of belonging to nature since a young lad. My 6th grade teacher, Mr. Moore, brought 60 students into the woods and “placed” us intermittently off the trail so as to not interfere with one another, whereafter we spent 4 hours in the woods “alone” on what was called the “four hour solo”. Since building the lean-to and cohabitating the woods with the squirrels and blue-jays while writing in my journal, I have been drawn to the wild. In the last few years, I have been building my kit to enter into the woods again. I have a Eberlestock Terminator, a Grans axe by Ray Mears, a terrific knife from Helle, and a few other items that I hold dear, including a sling-shot, which I have not, as of yet, shot. Thank you for such an inspiring article Paul. I want to go to Alaska in the winter.. Wonderful article, Paul, thanks so much for sharing it. I would really like to experience the far north in winter: once I’ve finished my current work, I’ll look at your trips. The practical advice about living in a tent is going to come in handy when I organise “frostbite” camps for Scouts and Explorers. I bought a tipi in the summer and enjoyed 3 weeks in it. Now I’ve bought a wood burning stove and plan to use it as a warm area on camp & will practise the skills from your article as much as the conditions allow. Thanks again for taking the time to share your knowledge. Thanks for your comments and I’m glad you have found value in my winter camping articles here. I appreciate you taking the time to let me know they’ve been useful to you and your Scouts. Thanks for sharing and good source of information. Sorry but have no plans to go further north than Aberystwyth in the winter, I’ll just keep reading your blog you never know it also snows in the UK.